Ox Creek is a warmwater stream that flows through Benton Harbor where it joins the Paw Paw. It originates in agricultural lands east of the city and drains an area of 16.5 square miles. The lower portion of the watershed is heavily influenced by urbanization and storm water. Ox Creek appears on Michigan’s §303(d) list because it is not meeting the “other indigenous aquatic life and wildlife” designated use; indicated by poor macroinvertebrate community ratings. Sedimentation, siltation, total suspended solids (TSS), and flow regime alterations are causes of the impairment. Sources of impairment are stream bank modifications and storm water quality and quantity. With Ox Creek not meeting state water quality standards and not being healthy for fish and other wildlife due to the large amount of polluted runoff it receives from the land, partners came together to bring in grant funds to address the pollution issues. - SWMPC is partnering with the Berrien Conservation District and Two Rivers Coalition to work with agricultural producers in the headwaters to implement best practices such as no-till, cover crops, buffers and wetland restoration. - Also, SWMPC is partnering with many to revitalize the Orchards Mall area to be more friendly to Ox Creek while also better accommodating pedestrians and bicyclists and spurring additional development and redevelopment. The Orchards Mall area is a key regional shopping district and a gateway to the Twin Cities. There are many opportunities to improve Ox Creek while also revitalizing this important economic activity center by greening it up to slow down and clean up polluted runoff. A TMDL was developed for Ox Creek, a tributary to the Paw Paw River. 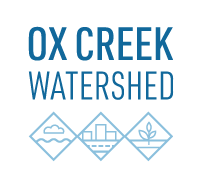 You can find out more about Ox Creek by reading the Ox Creek Fact Sheet (2009). Total Maximum Daily Load for Biota in Ox Creek: Berrien County, Michigan - May 10, 2013. Thank you to everyone that participated in the Pipestone Retail District Community Forum on Feb 8, 2017. Here is a summary that appeared on Moody on the Market. Click here to view the summary. To view the flyer click here! There was an Ox Creek Public meeting held on March 7, 2013 in Benton Harbor, MI. View the presentation from the meeting: Total Maximum Daily Load and Implementation Recommendations to Improve Water Quality in Ox Creek. Here is the handout from the meeting: Ox Creek TMDL Development. An Ox Creek Public Meeting on April 21, 2010, was held at 6:30 pm in Benton Township Hall, 1725 Territorial Rd, Benton Harbor. At the meeting the Ox Creek Watershed Characterization and Source Assessment Report was presented. Benton Charter Township Hall. The meeting was open to the public. The purpose was to present water quality data for Ox Creek (Benton Harbor) in preparation of the upcoming Total Maximum Daily Load (TMDL) development. A TMDL is being developed to identify the necessary pollutant reductions needed to meet water quality standards. Questions regarding this project may be directed to Tamara Lipsey, Department of Environmental Quality, Water Bureau, at 517-335-1058, or e-mail at lipseyt@michigan.gov. On Wednesday, January 27th, 2016 there was a free informative workshop, that took place at the MTEC Building (Room 134), 400 Klock Road, Benton Harbor, Michigan from 8:30 am to 12:00 pm. At this workshop,we learned about farming practices and also incentives available to farmers to build healthier soil and reduce polluted runoff into our drains, streams, rivers and lakes. The presentation also included topics on water quality, wetlands, USDA conservation practices and Michigan’s Agriculture Environmental Assurance Program (MAEAP). There was also a special demonstration showcasing the benefits of non-tilled versus tilled soil that may convince you to try no-till on your land. This workshop was part of a larger effort to reduce pollution in Ox Creek, the Paw Paw River, St. Joseph River and Lake Michigan. To view the Ox Creek's Erosion Problem press release click here. A successfully Community Outreach Event took place at the Livery Microbrewery on Thursday, May 5, 2016. Although the Paw Paw River has long been considered the environmental jewel of Southwest Michigan, its final tributary, Ox Creek, is often forgotten or ignored said Marcy Hamilton of the Southwest Michigan Planning Commission (SWMPC). SWMPC wants to change this and is heading up a coalition of environmental groups working on a grant project that is focused on water quality in Ox Creek. A community paddle event took place that day from 3:00 to 5:00 p.m. on the lower Paw Paw River. Paddlers explored the lower reaches of the river led by members of Two Rivers Coalition (TRC), one of the groups working on Ox Creek. The last time Marcy went paddling with Kevin Haight, president of TRC, three beaver dams were found on Ox Creek within the city limits of Benton Harbor. Although there are multiple threats to water quality in Ox Creek, Hamilton says this project is looking at the two biggest problems occurring upstream, sediment from agricultural operations and storm water run-off from the hundreds of acres of existing pavement, especially around the Orchards Mall area. One part of the project aims to educate farmers about best management practices that reduce or even eliminate soil running off their fields and then affecting water quality. Another part of the project involves transforming a portion of Wightman & Associates parking lot into a rain garden as a demonstration of how to reduce storm water runoff and provide beneficial habitat simultaneously. 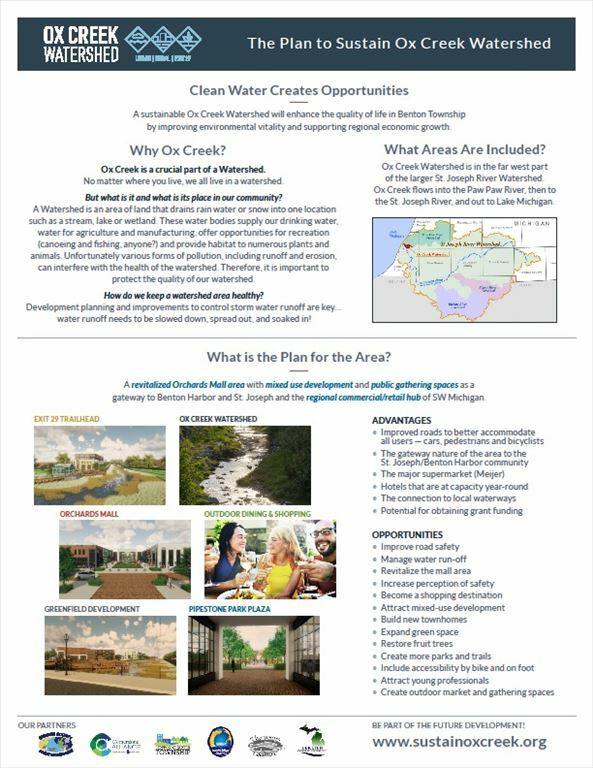 In addition to SWMPC and TRC, other local organizations working in partnership on the Ox Creek project include the Berrien Conservation District, Southwest Michigan Land Conservancy, Sarett Nature Center and Wightman & Associates.